2017 was the year #metoo swept across the world, and especially in the Nordic region. But what are the political consequences? The Nordic Labour Journal’s annual gender equality barometer, which looks at whether women or men hold 24 different positions of power in each country, shows small but at times historic changes. Every year we dish out 200 points, 40 in each country. The 24 positions of power have different numbers of points, from one point for an ordinary government minister, rising to five for the prime minister. When women achieve 100 points across the Nordic region, or 20 in one of the countries, we consider gender equality to have been achieved in this, albeit limited, field. We do our measurement on International Women’s Day, 8 March. Last year Nordic women secured 64 points. This year, thanks to Iceland’s new government led by Katrin Jakobsdottír, they score one more and the final result is 65. This falls short of the 2015 record of 67 points, but is still the second highest score so far. With Erna Solberg and Katrin Jakobsdottír, the Nordics have two of Europe’s six female prime ministers. The four other countries with female leaders are Germany, Great Britain, Romania and Serbia. The only country so far to get more than 20 points in the gender equality barometer is Norway. It breaks that limit again this year, but falls three points down to 21. The reason is that the Norwegian LO has had a male leader since 2017, Hans-Christian Gabrielsen. He replaced Gerd Kristiansen. In our barometer, which focuses on the labour market and the areas the Nordic Council of Ministers cooperates on, the LO leader gets four points. On the other hand, Norway did get its first ever female foreign minister last year – Ine Eriksen Søreide. She was appointed on 20 October, and the post gets two points. As she also left her position as defence minister to a man, this means just one extra point. 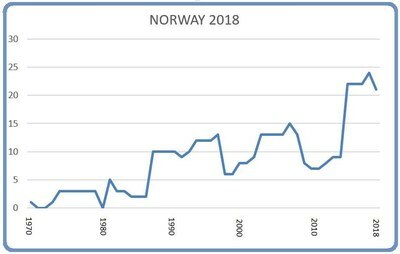 Other changes to the Norwegian government do not change the number of points awarded to the country. Never before have women held so much power as in the current government. Women hold three of the top posts: Prime Minister, Minister of Finance and Minister of Foreign Affairs. On 17 January this year, the Liberal Party (Venstre) became a new coalition partner, which means there are now three female party leaders in the government: Erna Solberg, Conservatives, Siv Jensen, Progress Party and Trine Skei Grande, the Liberal Party. It is a similar situation to that in Denmark between October 2011 to February 2014, when Helle Thorning Schmidt headed a coalition together with the Social Democratic Party, The Radical Liberal Party and the Socialist People's Party – all of which had female leaders. Yet in the Danish government, both the finance ministry and foreign ministry were headed by men. The Conservatives, Progress Party and Liberal Party were also hit by #metoo revelations. Finland is at the opposite end of the scale from Norway. Political life there has seen few changes. President Sauli Niinistö was re-elected on 28 January last year for another six year term, securing 62.7 percent of votes. Prime Minister Juha Sipilä’s government celebrated 1,000 days in power on 21 February. Six of its 17 members are women, including Minister of Local Government and Public Reforms Anu Vehviläinen, who is the country’s longest serving government minister with a total of 2,526 days of service, since she has also been a member of other governments. But the only female ministers among the 13 posts that we measure, include the Minister of Education Sanni Grahn-Lassonen, Minister of Social Affairs and Health Pirkko Mattila and Minister of Transport and Communications Anne Berner. This translates into three points. 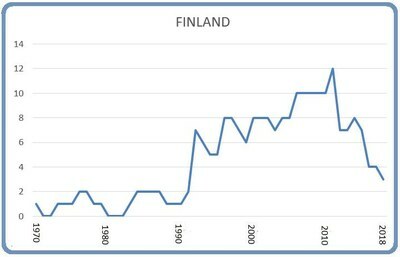 Finland does not get more points because there are no female leaders in the posts we measure within the labour market, nor in symbolically important posts elsewhere. Last year Sanni Grahn-Lassonen secured an extra point, since she at the time was both the Minister for Education and for Culture. But on 5 May 2017 she lost her culture portfolio. The last time a Nordic country got this low level of points was 19 years ago. 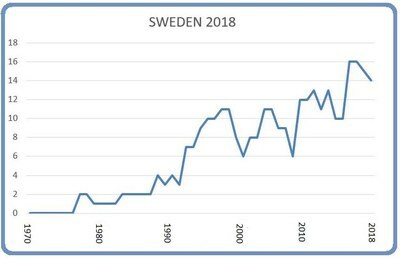 Sweden faced a government crisis in July 2017, when it emerged the Minister for Infrastructure Anna Johansson had contracted out the running of sensitive internal computer systems to countries like Serbia. Johansson was forced to resign and was replaced by Tomas Enerot. As a result, Sweden loses a point in the gender equality barometer and ends up with 14 points in total. Otherwise there have not been any changes to the gender balance, even though there are some new faces in some of the positions of power. The Chairman of the Confederation of Swedish Enterprise, Leif Östling, stepped down in November 2017 in the wake of his comments on taxation policies. A new chair will be elected in May 2018. Fredrik Peterson holds the position until then. A new national police commissioner, Anders Thonberg, has also been appointed. Things have remained stable in Denmark. Lars Løkke Rasmussen’s government now comprises 40 percent women – nine out of 22 government ministers are female. But the weightiest positions are still filled by men, and in our barometer the Danish government scores no more than the Finnish, only three points. 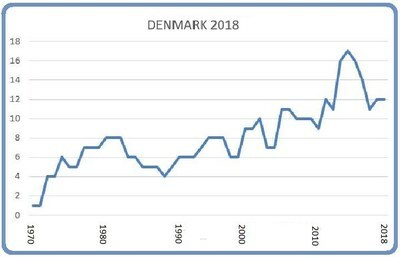 Lizette Risgaard, LO President, and Bente Sorgenfrey, President of the Salaried Employees' and Civil Servants' Confederation (FTF) push Denmark up to 12 points, the same as last year. Denmark also has the Nordic region’s only female head of state in Queen Margrethe. 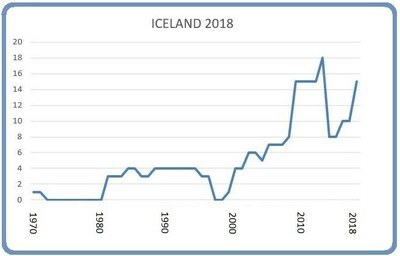 As mentioned above, Iceland has seen the greatest increase, from nine to 14 points. Prime Minister Katrin Jakobsdottír’s coalition comprises her own party, the Left-Green Movement, the Independence Party and the Progressive Party. At the start of the year, Iceland introduced a new gender equality law. All companies with more than 25 employees must now prove that wages are fairly divided between the sexes. #metoo has coloured the Icelandic debate too, with campaigns from actors and priests. 300 female politicians signed a petition in November 2017 and spoke out about various levels of sexual harassment. 50 percent female government minister representation might look like gender equality has been accomplished. But it also depends on which positions are being held by women. 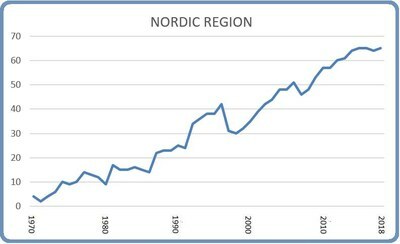 We have distributed 200 points - 40 for each Nordic country. 100 female points equals full gender equality. We have looked at 13 government minister posts. Each gives one point except prime minister (5), finance minister (3) and foreign minister (2). Leaders of confederations of trade unions (4), leaders of service industries unions (2), leaders of trade unions for academics (2), leaders of employers' organisations (2) and managing directors at employers' organisations (2). Heads of state, supreme court presidents, heads of central banks, arch bishops, police commissioners and commander-in-chief. Heads of state get three points, while the others get one each. We have not included leaders of major companies because they are not considered to be employed as a result of a democratic process. We measure at 8am on 8 March each year. We have made certain adjustments for Iceland. Since the country only has seven government ministries, some ministers have been given an extra point, giving Iceland the same maximum of 40 points as the other Nordic countries.